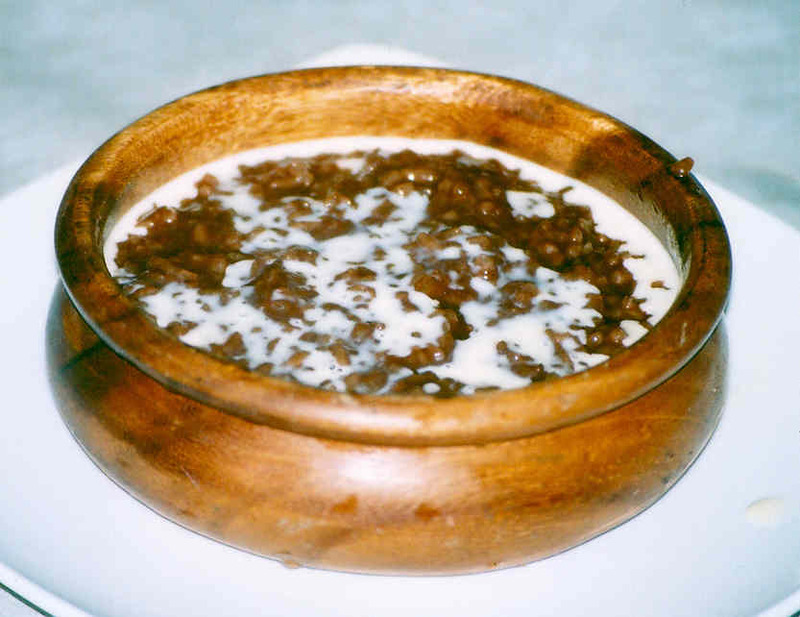 Champurado, or champorado, is common fare that has attained the status of comfort food. It is perfect for breakfast for the approaching cold months, though it is eaten any time of the year. Tsokolate, the native (local), hand-made chocolate, and champurado are actually festive fare that are associated with the Christmas season. The best way I can describe it is that it is a chocolate porridge. It is glutinous rice boiled with chocolate until thick and mushy, then milk is swirled onto it before serving. Ordinarily, left-over steamed rice can be used for champurado. It is put in a bowl, a chocolate beverage is poured on it, and mixed, much like having cereals in the morning. But the special kind is made with tablea, the native chocolate that is gritty and grainy, with hints of tang and zest, and smells and tastes of roasted cacao beans. And to be especially thick and viscous, glutinous rice is used. I eat champurado warm, mixed with a cup of evaporated milk, and topped with a teaspoon of powdered cinnamon. It brings back memories of cold misty dawns and blinking parols (star lanterns) in a myriad of colors, and the sound of tolling church bells vibrating in the air. And of a general feeling of euphoria, of a spirit shared by everyone who's kinder, more patient, more gracious. Of a world more hopeful. I like to cook the tsokolate thoroughly before adding the glutinous rice - fully dissolved, and preferably beaten for a silky smooth chocolate. I put an entire roll of tablea, about a dozen pieces, for 2-3 cups of glutinous rice, for an intense chocolate flavor. I follow the standard 1 tablea:1 cup water ratio. When the chocolate has been beaten, I add the rice and stir until cooked. Others eat champurado with flakes of tinapa (smoked fish), or tuyo (salted dried fish). The contrast in flavors is polar - smoky-sweet, salty-sweet. I prefer a monochromatic effect, though, so it's a simple chocolate-milk-cinnamon mix for me. When I am in the mood I mix in fruits - sliced bananas, grated apples and pears, which provide a slightly different shade of sweetness, highlighting the fruitiness of the chocolate. I have to send my mom to this post. I grew up with her always wanting her "chocolate rice". As a child I ate my rice with sugar but never could eat the chocolate version (which meant more for her!). May have to have Mom make some soon so I can try it since my tastes buds are more adventurous these days. It's perfect for the aproaching winter, Mrs. L! Though it is great eaten cold, too, during the warm months.